I may not be the biggest animal on the planet, but I’m not scared of anyone! We honey badgers have no fear when it comes to taking on bigger animals than ourselves, but unfortunately our numbers are running low across the planet as we lead solitary lives and our habitat is being destroyed. We may be the most fearless animals on the planet, but even we are scared of extinction. Please adopt me to make sure I survive to see another day. FREE entry to an Aspinall Foundation Park to see some amazing animals. 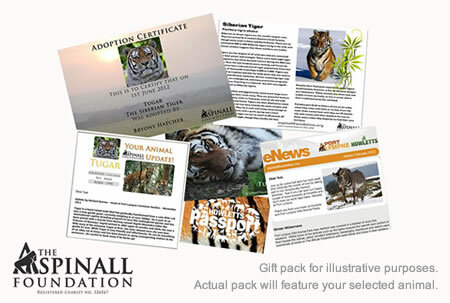 An e-gift pack that contains a computer desktop wallpaper, animal facts, an adoption certificate as well as a monthly e-newsletter. Twice yearly updates on how your animal is doing and the work the Aspinall Foundation are providing to help their fight for survival. Not only are honey badgers incredibly brave, they are also one of the smartest animals around. Check out this footage from a BBC documentary. 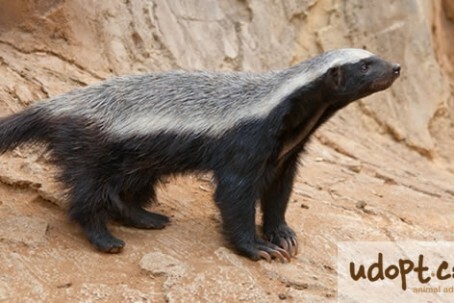 Stoffel is a honey badger who has been placed in a sanctuary to protect him from some bigger predators. See his increasingly clever attempts at escape! Honey badgers live a solitary life, which is a good thing as not many animals could handle two at a time! They are the most fearless animals on the planet and think nothing of stealing the food from animals 3-4 times their size (bring them on!). If you were unfortunate enough to get in a scuffle with a honey badger, be prepared as they are liable to fart in your face and scream at you! They live in climates as hot as their tempers and are definitely not be trifled with. The Aspinall Foundation have protected rare and endangered animals since 1984 and they are one of the world’s leading conservation authorities today. Support their work by adopting an animal as a great gift. Packages include FREE entrance to their UK zoos, making it a great family day out. Also included are animal updates and adoption certificate. The main welcome pack is delivered via email. The membership card will be delivered within 10 days. This is an ideal last-minute gift as your personalised adoption gift pack is sent immediately following the confirmation of the order via email. The honey badgers skin is very thick; making them resistant to attacks with arrows, spears and even blows from machete. Honey badgers will quite happily steal a leopard’s food when it’s not looking. They know no fear! Honey badgers have a very distinctive waddle when they run, but if you thought that might mean they are unintelligent, you would be wrong. You can currently find the last few honey badgers in Africa, Southwest Asia, and the Indian Subcontinent. Honey badgers are slowly slipping into the endangered species bracket due to their habitat being destroyed. They may not be the prettiest animal on the planet, but they are certainly the most fearless, and have just as much right to live on the earth as any other creature. There is a choice of 4 different types of adoption to suit the amount your wish to give, making this a gift that can be given more easily than others. Receive FREE entry to an Aspinall Foundation Park. Adoption programmes start from as little as £3.50 a month.